1980’s and 90’s were the days of Femina and Womensera magazines in India. If you wanted a new age recipe, that was the place most ladies thronged to. There was no internet and no blog. There was a lot of time and no information overload. Cook books and the few magazines were the only source of new recipes if one wanted to try. My neighbor Shantaka regularly subscribed to Femina and this recipe was featured in the magazine years back. She made this and that was the first time I had fish cutlets in my life. During my school days, cutlets were all the rage. The crisp slight sweetness from the bread crumb crust was something I really loved and I still do. 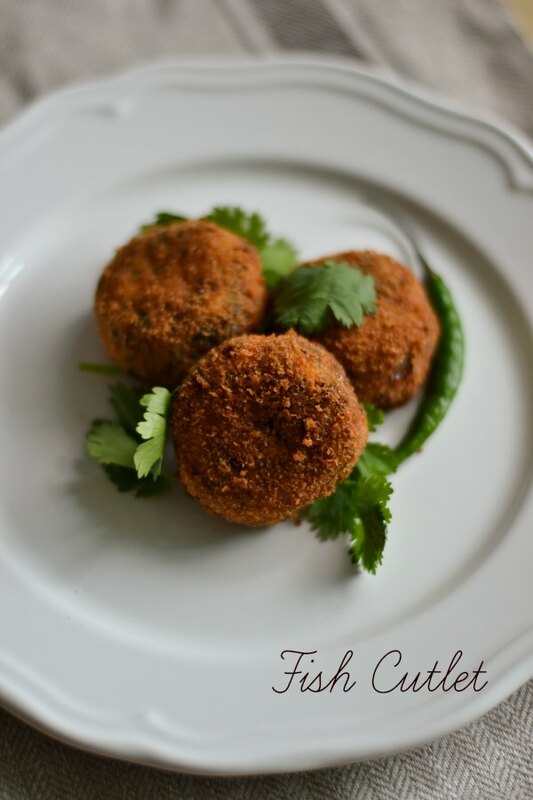 These fish cutlets are very easy to do and can be done within minutes. The only prep work that is needed is to boil and mash the potatoes, steam and shred the fish filets. If you cannot get fish filets, steam the fish and remove the skin and the bones. Shred them and set aside. Today I have used Salmon filets for the cutlet. Cat Fish etc.. also works fine. Here is a detailed video recipe of how to do fish cutlets. Enjoy your fish cutlets with ketchup and mayo. Easy recipe for deep fried fish cutlets. These fish cutlets can be made quick and it can be prepared well in advance. Heat oil in a pan and add in the minced ginger. Fry for a minute. Add in the onions and green chillies. Fry till the onions are soft. Add in the mashed potatoes, shredded fish, mint leaves and coriander leaves. Take 2 tablespoon of the fish mixture and make small patties. Press them in between the palm and make it into a firm patty. Repeat with the remaining mixture. Take two bowls. Fill one with the beaten egg and the other with bread crumbs. Dip the patties in the eggs and then roll it in the bread crumbs. At this stage, the patties can be refrigerated for up to 2 days and fried when necessary. The patties may also be frozen at this stage for up to a month. Just thaw to room temperature and proceed. Heat oil until hot. Gently place the patties in hot oil and fry them till golden. Freeze the bread crumb coated patties on a plate for about 4-5 hours. Make sure they don't stick to each other. Then remove the plate and transfer the patties into zip lock bags. By doing this way, the patties wont get smashed and they will remain in individual pieces without getting stuck to each other. Just remove the patties 30 minutes before and thaw them at room temperature. Can I substitute semolina for breadcrumbs? How would the taste change? And why is it that many fish cutlet recipes seem to suggest breadcrumbs instead of semolina? Awesome recipe,thanks Suguna,bought back childhood memories as my grandma would often make fish n prawn cutlets. 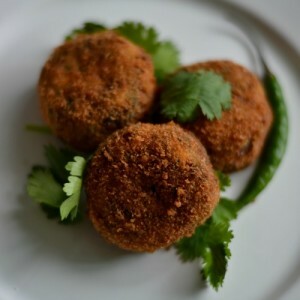 I have tried ur rava Kesari and iam confident abt ur recipe..am planning to make this cutlet tomorrow, thank you..
hi, can i shallow fry them,will it taste d same way? Sure. You can shallow fry. 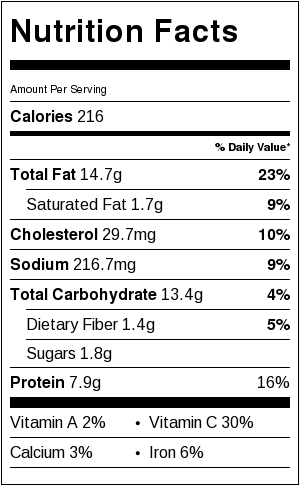 Can we use salmon fish for this recipe? The recipes are awesome and easy.. especially me being coimbatorean, most of the dishes meet my family’s expeectation. Thanks for bringing up your knowledge to the wider forum and being beneficial to many..
Great effort Sisy.. well done.. Proud of you. This one reminded me of those wonderful college days where we wait for the cutlet Wednesday.It turned out very well.We finished everything within 10 mins. so nice Raji. Cutlet is memories….